Last night a light snow moved into the area and since the small town of Lititz,Pa was holding its annual fire and ice festival this weekend I decided to brave the elements and get a few shots. I woke at 5 am today,went back to bed and laid there pondering the choice of staying nice and cozy in bed or going out into 2 degree weather with thirty mile an hour winds that made it feel a wonderful minus 18 degrees. Well I finally mustered the enthusiasm to get bundled up and head out and this shot of old man winter blowing his air was very apropos for the day. I lit this with flash and intentionally did a shot to cast the shadow onto the snow for added interest. 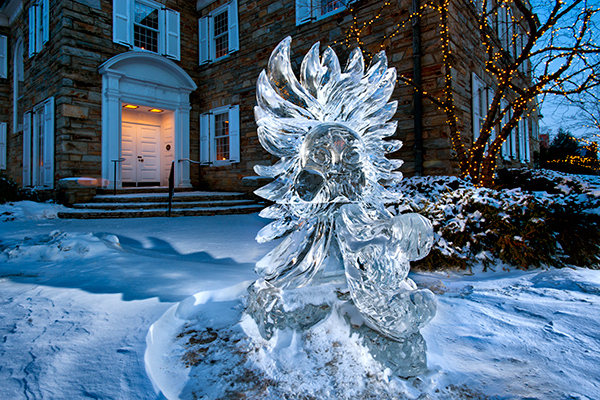 Ice is very tricky to light and getting the right angle takes a little work to reveal the carving details. I shot for about twenty minutes till my two batteries were drained, and then I sat in my truck with the heater warming them up to bring them back to life for a few more shots. I bounce back and forth between really enjoying mother natures intense weather and asking myself what possesses me to go out in weather like this? Inevitably I must take a glove off to change camera settings and today that was a really numbing experience after about a minute of the glove off. The upside was there was only three other brave souls that I encountered taking photos of these things and they all had cell phones. The guys who carve these do a great job using a variety of tools from chain saws to grinders to blow torches and the event is always packed with visitors from near and far. This entry was posted in Uncategorized and tagged fire and ice festival, lancaster county, Light Painting, lititz, lititz fire and ice, pa, Photography. Bookmark the permalink. thank you, for braving the elements, Don !! Beautiful shot….. I went there Friday morning to see what was going on and although it was probably 20 degrees warmer, the wind made it almost unbearable. I can only imagine how you felt today. Good to see you’re back out doing what you love. I took a few shots and am not happy with them, but wanted you to know there are others doing the same thing. Its only bad when you get home, decide that for one reason or another the shot is not a keeper, and delete them all. at least your out there trying. nice shot,and i took a quick one of that horse before my batteries died again.